Hatchlings should be at least 6 inches long at time of purchase. They should appear nice and fat with a good appetite and have clear alert eyes. Cage size: 20 or 30 gallon tank till the dragons maximum length is 12 to 15inches then 4 ft long cage is needed. Substrate: paper towel, newspaper, or no substrate. Cage furniture: Keep it simple for young dragons. Just a brick for basking will do. Anything else makes it too hard for the young dragon to find its food and allows places for crickets to hide. Night heat: Only needed if it gets down to 70 degrees. Feeding: Two or three times daily. Crickets should be no longer then the space between the young dragons eyes. Because of its chitin, (exoskeleton) larger crickets could cause impaction which can lead to paralysis and or death. Silkworms do not have a hard exoskeleton and are safe to feed to young dragons even when the insect is longer then the space between the eyes. Mealworms are also not a good choice for young dragons. They again have the chitin (exoskeleton ) that can cause impaction and their gut (digestible portion) to chitin ratio leaves very little actual food that the dragons can digest. Crickets not eaten in 10 minutes should be removed from the cage. Crickets left behind will nibble on poop or your sleeping dragon! Silkworms can be left in a dish or sitting on the veggies/salad. They don’t crawl away and won’t bite your dragon. Dragons eat 30 to 60 prey insects daily so be sure you have a good supplier! Dust one meal everyday with the calcium (big pinch) powder and the Herptivite (tiny pinch) 2 times weekly. Vegetables/fruits should be finely chopped and placed in a bowl left in full view of your young dragon. I’ve used silkworms to teach stubborn dragons to eat their veggies. I just place the silkworms right on top of the veggies. Their sticky feet cling to the finely chopped greens so that when the dragon gobbles up the silkworm the greens come along for the ride and get eaten too. The last feeding should be at least two or three hours before the lights go out. If you feed too late at night the food just sits in the dragons stomach undigested and allows bacteria to grow causing digestive upsets. Very young dragons should be misted with water 2 or 3 times daily. Spray the water on the dragons head or walls by their face and allow the dragons to lick it up. When they are done licking they are done drinking. Be sure the cage has time to dry out between mistings. A fifteen minute soak in a warm bath once a week helps with hydration and shedding. Lights should be on about 14 hours a day. Use a timer …. It really helps! Dragons grow throughout their lives but most of the rapid growth is done by 18 months of age. It is then that changes in care and diet need to be done. Basking temperatures can be lowered to 95 to 105 degrees. They can tolerate night temps into the low 60 degree range so night heat may not be needed. If your dragon still prefers a higher basking temperature that is fine. The cool side should still be around 80 degrees or cooler. Each adult dragon needs a minimum of four feet of floor space so be sure to plan their adult housing accordingly. A 55 gallon or 40 gallon long aquarium meets this basic need. The new enclosures offered by many reptile cage building web sites offer a nice alternative. They offer a variety of sizes and most can be stacked. Dragons do like to climb so don’t get one that is too short. The size I like best for one dragon is 48 inches long, 18 to 24 inches deep, and 18 to 24 inches high. The only draw back is many of the enclosures hold too much heat and its very difficult to get the hot and cold sides right. If you can get the temps right it can make a very attractive home for your dragon. Adult dragons should eat more vegetables and less insects. 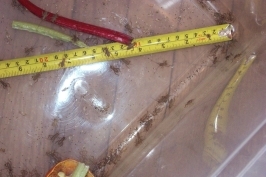 About 80 percent vegetables and 20 percent insects is ideal. Just a few insects daily or offered in larger quantities 3 times a week should be sufficient. Offer fresh greens and fruits daily. Even though adult dragons get most of their moisture from their food I would still recommend misting them once daily (especially on hot days) with water in addition to their weekly bath. Dragons 10 inches and larger can now be housed on clean high quality sifted play sand. My dragons like to dig in it and I have one dragon that loves to jump off his cave and land in it then squiggle around. I use a metal screened scoop available at places like Petco or Pet Supplies Plus to scoop the poop from the sand. The damp or dried soiled sand stays pretty much in the scooper leaving a nice clean cage behind. Adult dragons will shut down or brumate anywhere’s from 3 weeks to 3 months. It is part of their natural cycle. Lowering the temperatures in the cage and shortening the time the lights remain on will assist your pet in achieving this natural cycle. Be sure to check on your dragon and still offer greens daily, choice insects (when they are awake), and weekly baths. They will not eat much but it needs to be offered so your dragon can remain hydrated and healthy. When coming out of brumation slowly return the temperature and lights to what they were before. Bearded dragons will lose a small amount of weight while brumating so temporarily offer larger quantities of insects and fatty foods like waxworms and fruits till they regain their weight. Vegetables - collard greens, turnip greens dandelion leaves, kale, radicchio, chopped carrot, chopped apples, sliced banana or strawberries, plus more! There are many ways to set up suitable living quarters for your bearded dragon. Here is a few suggestions. First, you must keep in mind that an adult bearded dragon needs a minimum of four feet of floor space. It is also better to have their living quarters longer then wider, it will be easier to maintain the proper temperatures. I would recommend going ahead and getting an adult size enclosure and sectioning off part of it to make it the right size for a hatchling/juvenile dragon. Place the clean dry substrate in the bottom of the tank. This can be clean sifted play sand ( not suitable for dragons under 10 inches in length), reptile carpet, paper towels, newspaper, linoleum, ceramic tile, slate or no substrate at all. 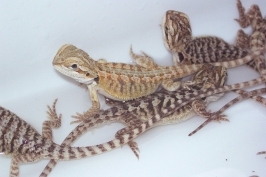 Calcium sand, bird seed, crushed walnut shells and others have been know to cause impaction and death in Bearded Dragons so PLEASE do NOT use these. Pet litter, aspen, pine shavings etc. not only can cause impaction too but hold moisture and bacteria and are also bad for dragons and can make them sick. On the side your dragon will be basking, "hot" side, place something they can crawl unto. You can use a clean sterilized piece of driftwood, a basking rock, a brick or even make a cave using two bricks with a piece of slate. The opposite side of the tank will be your “cool” side. This is important because your dragon MUST be able to regulate its body temperature by traveling between these two areas. The “cool” side is where you will place the vegetables and, if you use one, a water dish. You can even place a cave or hide on the cool side too. Place your aluminum screen lid on top. I do not recommend using hardware cloth or nylon screening because crickets can chew through it and a dragons claws can tear it easily. Although not necessary, a hinged lid allows you easy access to your dragon without having to move all the lights around. There are several options to lighting and heating your cage. For heat/light I recommend a reflective spot lamp available at most hardware stores. Depending on your home you will need anywhere’s from 75 to 160 watt bulb to maintain the proper basking spot temp. For night heat (if needed) use a night heat bulb or a ceramic heat bulb (these last much longer) around 50 to 100 watts. For UVB lighting there are pretty much only two choices, florescent or self ballasted mercury vapor bulbs. 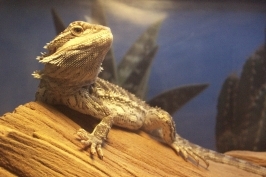 Bearded dragons need a lot of UVB so try to chose bulbs with higher UVB levels. A fluorescent bulb is the most commonly used but with most of these bulbs the out put is low so your dragon has to be able to get within 6 inches of it to benefit from its rays and needs replacing after six months. I have recently found a new fluorecent bulb offered through “Big Apple Herps”, the "UVB Mystic" bulb. It has a very high UVB output and reaches farther into the cage but I am not sure how long it lasts. So far, after six months of use, I have not noticed any drop in the UVB levels.The bulb does run a bit hot meaning it draws a lot of current so I recommend using it in a metal fixture. It melted the plastic one I had. I am still testing this bulb and will report my findings when I have them. So far due to to the high UVB out put only leave this bulb on for 2 -3 hours daily and keep your dragon 8 to 10 inches from the bulb.....these bulbs are STRONG!!! I like to break up the time the bulb stays on into two seperate 1 1/2 hour intervals. The first at 10am the second at 2pm. I do like using the mercury vapor bulbs too, in particular, the “Power Sun”. They can double as a heat source and light and like all mercury vapor bulbs are available as 100 and 160 watts. The UVB rays last at least one year and the bulb even comes with a one year warranty.When using these bulbs (dragons due better with lots of light) I use an inexpensive florescent light to light the rest of the cage. For day and night heat use the appropriate domes with ceramic sockets (they can handle the high usage and high watts). Do not let any of your bulbs touch the screen, this could shorten the life of your bulbs. To get the temperatures right, either buy several wattages of bulbs and work with that or try the adjustable light stands that are available. I like the stands better because they swing the bulbs out of the way when I need too and move up and down so I can get the proper basking temperatures. Use your digital thermometer resting on the basking spot closest to the heat source to get the proper reading. Measure the temperature at the lowest point on the cool side to get the proper reading there. To clean your cage use soap and water and wipe down. Scoop or wipe up poop daily. 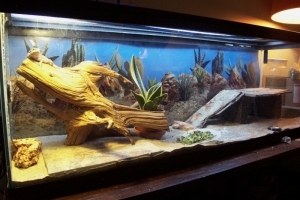 Replace substrate or cage furniture as needed. To sterilize use a 10 percent bleach solution or use the new non-bleach disposable wipes. For cage furniture wipe down or remove and scrub in the sink with soap and water or let soak in bleach solution then soak in clear water and let dry. IMPORTANT NOTE: When using bleach or any cleaner be sure it is safe to use around animals AND remove your pet from their home while cleaning. Once things have dried and are fume free THEN return your pet to their home. Most dragons are pretty hardy and need very few visits to the vet. When you do have to use a vet find one that specializes in bearded dragons. Besides an initial check up a regular stool check for parasites should be done a minumum of one time a year. 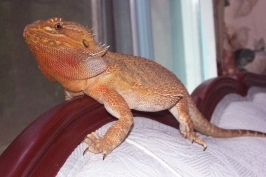 I have my dragons checked just before brumating and sometimes before I breed them. Even if your dragon is free of parasites one time they are constantly exposed to them through the prey that they eat and could become infected later. Getting a good food provider for prey insects and maintaining and keeping the insect bins clean goes along way to helping prevent exposure to parasites. VISIT my links page for more helpful resources!